A familiar baseball stereotype of the mid-twentieth century was the “good field, no hit” Latino shortstop. The prototype was captured by Willy Miranda – who many contend was the slickest Cuban glove man ever born but who ended his near-decade-long sojourn in the majors with a mere 70 extra base hits and a lightweight .221 batting average. Other Cuban imports like José Valdivielso, Humberto “Chico” Fernández, Juan Delis and Ozzie Alvarez also fit the popular pattern perfectly. The pioneering Cuban who broke the stereotype of the "good field, no hit" Latino shortstop was also the initial "foreigner" to earn MLB MVP honors. 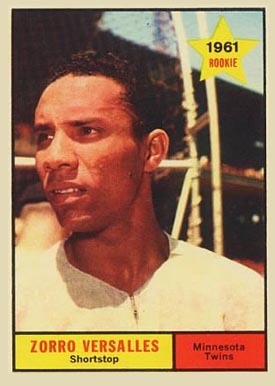 Havana-born Zoilo Versalles contributed heavily to overturning this image in the early 1960s by twice pacing the junior circuit in triples and reaching double figures for home runs on three consecutive occasions. Then he obliterated the image altogether in 1965 with a breakout offensive campaign for the surprising American League champion Minnesota Twins. The wiry, at times bespectacled Cuban was the very first Latin American import – actually the first-ever non-USA-born athlete – to capture a big-league MVP award. That distinction, albeit much debated in later years, will always overshadow all the other peaks and valleys of an admittedly imbalanced and inconsistent career. Versalles has also been frequently dismissed simply as a one-year wonder, but this too is something of a misconception. Although the Cuban’s rise was indeed striking, he had already enjoyed some notable successes before the Twins’ championship summer. The two previous years he had already paced the junior circuit with double figures in triples; he slugged 20 homers in 1964 (one better than his MVP total and the same number Felix Mantilla reached a year later in Boston). He also made the AL All-Star team in 1963, and as early as his rookie summer of 1961, he had demonstrated considerable offensive talent with a .280 batting average and 25 doubles. The cascade off the mountaintop may have been rapid after 1965, but the build-up was more gradual than rocket-like. And if the new Cuban Comet (a designation he may have better deserved than the highly consistent Minnie Miñoso) failed to sustain his peak performance, he nonetheless left a strong legacy.